Praise for the First Edition "This is the most usable decision support systems text. [i]t is far better than any other text in the field" -Computing Reviews Computer-based systems known as decision support systems (DSS) play a vital role in helping professionals across various fields of practice understand what information is needed, when it is needed, and in what form in order to make smart and valuable business decisions. 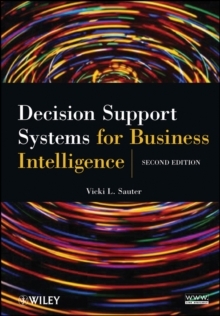 Providing a unique combination of theory, applications, and technology, Decision Support Systems for Business Intelligence, Second Edition supplies readers with the hands-on approach that is needed to understand the implications of theory to DSS design as well as the skills needed to construct a DSS. This new edition reflects numerous advances in the field as well as the latest related technological developments. By addressing all topics on three levels-general theory, implications for DSS design, and code development-the author presents an integrated analysis of what every DSS designer needs to know. This Second Edition features: * Expanded coverage of data mining with new examples * Newly added discussion of business intelligence and transnational corporations * Discussion of the increased capabilities of databases and the significant growth of user interfaces and models * Emphasis on analytics to encourage DSS builders to utilize sufficient modeling support in their systems * A thoroughly updated section on data warehousing including architecture, data adjustment, and data scrubbing * Explanations and implications of DSS differences across cultures and the challenges associated with transnational systems Each chapter discusses various aspects of DSS that exist in real-world applications, and one main example of a DSS to facilitate car purchases is used throughout the entire book. It also serves as a practical reference for professionals working in the fields of business, statistics, engineering, and computer technology.